Artists have long been smitten with a color, cobalt blue, that traveled from the mines of Persia to China. Persians used a cobalt glaze for the blue tiles of their mosques to represent the heavens. Thank Jacques Thenard, a 19th century French scientist, for purifying cobalt into a pigment useable in paintboxes. This entry was posted in Transition Metals, View All Elements and tagged Ryn. 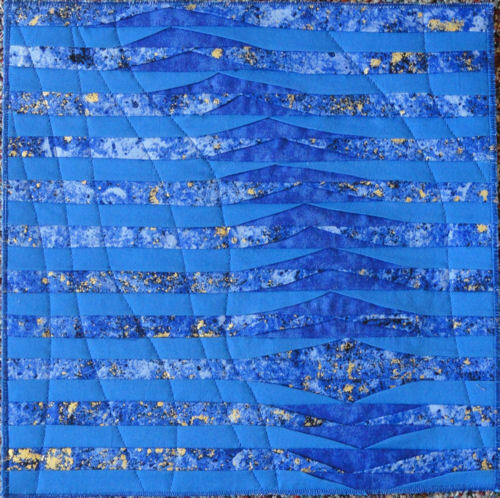 The blues are so rich in this piece. I love blue fabric and have a collection of cobalt glass. The wavy movement intrigues me. Can I borrow this piece? and forget to give it back? Thanks for your interest in our Elements show. This piece was challenging as a technique but my love of the colors propelled me along to completion. Your kind comments wil cause me to approach other new techniques with renewed confidence. Watch for cadmium, that sneaky element, soon to be uploaded.